Mom, me, I voted stickers- missing Dad. 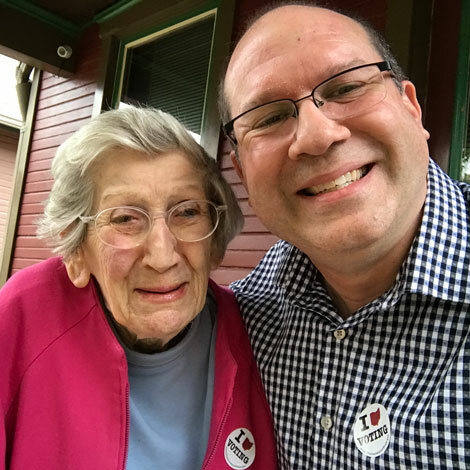 Today was the first election day, where I didn’t have my dad to talk to, to take to the polls, to take the photo of him, mom and me on their porch with our “I voted today” sticker. My father believed in this country, its ideals, its principles. He also believed strongly in the fourth estate, of which he was a part of, to keep us informed, to set wrongs right, to make our country better, through an informed electorate. Today, Wright State Medical School called to tell me the brick, bearing his name, was installed today. He had donated his body to the school- in the hope that some young doctor, might be able to learn something and go on to do good. But, at 2:14 am, I sit here writing, with Donald Trump 5 electoral college votes short of a win. With the Republicans holding on to the house and senate, and potentially appointing three supreme court justices. Wall Street and World Financial Markets are in a tailspin. And, frankly, the entire country is in shock- that he won, that she lost, that it was this close… but, as I’ve been known to say, “never underestimate the stupidity of people in large numbers” – a quote that is sometimes attributed to George Carlin, but probably wasn’t his. It’s not that he won, or she lost that has me in shock, it’s that in this election we went from the already tainted dirty world of politics, down to something more resembling a cage fight to the death. This was the election where, quite frankly, there were no holds barred, no blows too low, or any resemblance to statesmanship, decorum or decency. Our country will need a lot of healing. And a lot less polls, predictions and armchair quarterbacks. We need to take the cards that have been dealt, and figure out how to win, if that is even remotely possible. And on that note, I have to recount the high point of today. I went to the Dayton School Board meeting, where, per usual, the agenda was posted last minute and the failed transparency and communication skills of the worst district in the state were about to be glaringly obviously exposed. About 50 people showed up in addition to the normal cast of characters. There were parents, para-professionals, principals (more correctly, principal, Mr. Fowler of Kiser) and teachers- all there to talk to the board about cuts being made in classrooms across the district. And per usual, the people we elected to that board, felt very little need to hear from the people they represent. It was that same attitude by the Dayton City Commission 30 years ago, that pushed me into politics. The board opened, and immediately went into executive session, for what Board President Dr. Adil Baguirov said would be “about an hour.” The people in the room had no clue of what this meant, or what it was about. The district no longer prints agendas, instead using some wonky flawed, non-ADA compliant, proprietary software called Board Docs- that is worthless on a mobile device. A parent stood up and said, “since they are having a private meeting, is there any reason we can’t have one? Right here? I’m a social worker and I’m good at facilitating these kinds of things” or something to that effect. I started the video camera back up and taped. It should be posted tomorrow afternoon. That the BOE doesn’t tape all their meetings and have them available is one more indication of their disdain for the people they represent- they have an amazing video system available with robotic cameras. There was talk of the 1-1 computer plan- and how a chromebook can’t show a child from the Congo how to open a milk container, or teach a kindergartner how to use a mouse. There were stories of how teachers had some of their students come back to the district to teach- and one mother/teacher- who told her daughter to avoid DPS, because of this very issue- lack of respect for those who are doing the work in the trenches. The director of the Challenger School who was on the list to be fired today, had to pull herself together to talk about losing her baby of 25 years- one of the few things the district has that’s a real success- something that brought STEM to the district before anyone knew what STEM was. There was a bus driver who professed his knowledge of how to fix the most fundamental DPS problem- actually picking up and delivering students- on time. The entire group would love nothing more than that to happen- and can’t understand on how or why it hasn’t. And while I was there recording it – ostensibly as a citizen journalist, I did something I shouldn’t have and shared my story of the districts ineptitude in PR, marketing, managing an RFP, and even in their failed deal making on real estate where they sold a property to CareSource without a deed restriction precluding tax abatement. What shocked me more, other than my own self-exclusion from potentially working for the district to help them not screw up in the future- was when Dayton Daily News reporter Jeremy Kelley spoke up and interjected some facts about executive sessions and process and procedure- that, my friends, was a first. After an hour and a half- the social worker felt that everyone had had their time to share, and wondered where the board was. She announced her intention to go invite them to come and hear the ideas they’d gathered- and to ask the board why they weren’t coming back on time. I knew what was about to happen, and didn’t intervene. I thought maybe someone else would be galvanized to action after being smacked down for asking for respect and integrity from elected officials. For her honorable intentions, she was chastised by several board members, treated like a child and put in a corner. DPS security chief, Jamie Bullens appeared with one of his aides, dressed in black shirts, and stood by, in case she didn’t get the message. Then came the speeches. Dr. Baguirov stated facts on falling enrollment, from 2000 to today. He talked about the ratio of administration to students- a stunning 1 administrator for every 136 students. Cincinnati, is at 1 to 236. Yet, we were only firing 20. Today. The youngster on the board, John McManus tried to single out the Challenger center director for a pass from todays lynching. He had Sheila Taylor on his side for a few, until Joe Lacey, who has become cranky and sour, schooled the rest of the board about his experience during the last reduction in force. And Hazel Rountree launched into a tirade about how we had to bring in someone outside to fix what what couldn’t be fixed before. Ron Lee did point out that there are many unintended consequences to each and every dismissal- from seniority bumps to lawsuits, but in the end- the list was executed. And of course, the board felt the need to blame the state, the feds, and everyone else for their difficulties, telling the people to go fix that for them. Expect the Nov 17 meeting to be overrun with pissed off people. It will be ugly.. Both Debbie Lieberman and Judy Dodge spent real money on their reelection, despite being challenged by financially weak republicans with zero party support. Judy won over Bob Matthews by 3% Debbie squeaked by Gary Leitzell with a single point plus lead. And the county went to Trump. A giant FAIL to Mark Owens, Nan Whaley, Karl Keith, who were incapable of fielding candidates that could even come close to winning. This is what happens when all you worry about is keeping your job, shilling for Hillary and getting your mitts on peoples paychecks who can’t vote you out of office. If there was a time for a group of real democrats to join together to overthrow the Monarchy of Montgomery County, this would be it. Just the fact that embattled sheriff and republican party chair Phil Plummer was unopposed should be enough to shame them, if there was any shame to be had. It is now 3:01 am and I checked the NY Times site, and we have a misogynist president who promised to “Make America Great Again.” My father has turned over in his cold storage. My worst fears have almost all come true. Like Britain after the Brexit vote, we now have a brand new reality facing us. You’re a good son, Dave. Taking care of your mom, getting her to the polls to vote.